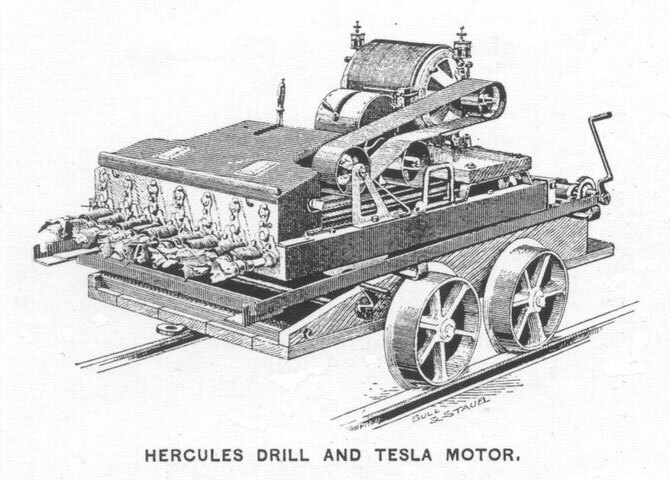 In Tesla's patent US514,972 - Electric Railway System - February 20, 1894, high-frequency, high-potential railway picks up its power inductively without the use of the rolling or sliding contacts used in conventional trolley or third-rail systems. A pickup bar travels near a cable carrying the oscillating energy. This cable, which Tesla specifically invented to carry such currents, is the precursor of the grounded shielded cable used today to carry TV and other high-frequency signals. But unlike today's cables, which carry energy only of signal strength and shield by means of a continuous grounded static screen of fine braided copper wire, Tesla's high voltage cable uses metal pipe or screen that is broken up into short lengths, very much shorter, says Tesla in his patent, than the wave lengths of the current used. This feature reduces loss. Since the shielding must not be interrupted, the short sections are made to overlap but are insulated from one another. To further reduce loss to ground, an inductance of high ohmic resistance or a small capacity is placed in the ground line. A conundrum raised by Tesla's railway patent US514,972 - Electric Railway System - February 20, 1894 is that the vehicle is powered by an electric motor, but nowhere among Tesla's inventions is to be found an electric motor that runs off of high-frequency currents. Was Tesla planning to use a lower frequency here, something under 1,000 cycles? Did he have a converter in mind that could bring the frequency down? Or did Tesla invent a high-frequency motor that never made it into patent, an invention that may be among his unpublished notes? Anyway, Tesla proceeds in many of his discussions of high-frequency power as if this problem were solved. Tesla advocates in the letter below about using a multiphase induction motor to increase the efficiency of an electric car. It is likely that his electric car that he built in the 1930′s utilized one of his multi-phased induction motors. The power source, according to his assistant Authur Matthews first hand account, invented by Tesla, was a unique primary battery that was used to power the car. This battery was unique in that it had replaceable zinc electrodes. When the zinc was used up it was simply replaced. This system would require a direct current to multiphase power converter. Tesla states that he made numerous statements in publications in regards to using electricity to power a car. Tracking down these statements should dispel the myth that his car was powered by radiant energy. In view of the great interest which is being taken in the articles published by the Manufacturers' Record and some of the magazines on the development of new power-producers, through the internal-combustion engine, for use for transportation purposes both by land and sea, the following signed statement, made by Mr. Nicola Tesla after a discussion of a new type of auto-bus designed by Mr. Charles A. Lieb, mechanical engineer of the Manhattan Transit Co., will doubtless be read with much general interest. I have myself for many years advocated this principle. Your will find in numerous technical publications statements made by me to this effect. In my article in the Century, June, 1900, I said, in dealing with the subject: 'Steamers and trains are still being propelled by the direct application of steam power to shafts or axles. A much greater percentage of the heat energy of the fuel could be transformed in motive energy by using, in place of the adopted marine engines and locomotives, dynamos driven by specially designed high-pressure steam or gas engines, by utilizing the electricity generated for the propulsion. A gain of 50 to 100 percent, in the effective energy derived from the fuel could be secured in this manner. It is difficult to understand why a fact so plain and obvious is not receiving more attention from engineers. I don't remember anywhere in his notes about a 'unique' auto battery. He had a 'box' that converted DC into 3 phase AC to feed his car motor. he had a 6 volt car battery driving a 6 volt DC motor with a three segment 'rotary switch' set to generate a spark of 'Dark Energy' (Tesla's words) 60 times a second, with each 'segment' offset by 120 degrees to generate 3 phase AC at the output of his 'Tesla Transformers' with an iron core driven to 'saturation' (like a finger on a wine glass).. When you drive any crystalline material to 'saturation' it vibrates at a much higher 'power' than the applied excitation. 'A Lead-Crystal glass exploding as the opera singers hit 'High C'. Uncontrolled oscillations feeding 'Out of Phase' building to a catastrophic level. Tesla's Dark Energy is "Reverse EMF" generated by an inductive load (coil or motor) when the applied voltage is removed. So called 'Kick Back' voltages can be an order of 100X the original applied voltage (depending on the size of the coil). In a lab test with the US NRC, an applied voltage of 12 volts (in parallel with a 1 Henry Coil) generated an "Dark Energy Spike" of just over 750 Volts (ringing AC). This is below the normal operating voltage of a 'typical' automotive Ignition Coil (12 volts DC in - 3,500 volts ringing AC out). In other words - A Tesla Coil. There was a unique auto battery using replacement electrodes in an experiment around the same time in Dallas, TX where one man used a specially designed battery to 'generate' large amounts of Hydrogen and Oxygen to power his tiny 'low compression' motor around White Rock Lake. Maybe it was another use of a Tesla Battery ??? Don't know as the 'inventor' was found "burned beyond recognition" in his car a few days later. I have a copy of his patent (a high capacity Hydrogen/Oxygen generating cell), using water and concentrated Sulfuric Acid. ''Pour in a gallon of water, drive 10 miles.. pour in another gallon of water and drive 10 miles back to starting point..'' Dallas Morning News, 1936.